Dear Kimberly, This is just a short note to say thank you for our lovely evening at Tea Grannys and Friends. We feel that you went to a lot of trouble for us and if you treat all your customers as you did us, your tea room will be a roaring success. Thank you again for a memorable experience. Just a short note to say how much I enjoyed your Victorian Tea this afternoon. You have a beautiful ambiance for this occasion and your menu of teas and sweets are superb. Would recommend you to anyone, actually I just gave your brochure to a neighbour a few moments ago. Thank you again. Visiting Tea Grannys and Friends is to visit a more gentile period, graciously presented by Kimberly and Ivan. How very special you make us feel and how delicious the luncheon. The Victorian tea was a treasured birthday gift for my friend, who still hasn't stopped talking about it! First I would like to express my gratitude and thanks for an absolutely amazing Valentine's experience. It will be one that I will remain in my fondest memories for years to come. (I'm not sure how Craig will be able to top it!) The food was exceptional and your attentiveness and service truly made me feel like a Lady. Thank you for all your efforts and sacrificing your evening for our pleasure. On behalf of my partner and I, we would like to sincerely thank you for a wonderful Tea Experience! We recently brought my Mother for her birthday and she thoroughly enjoyed your hospitality, tasty food and the Victorian ambiance of your tearoom. What a pleasure to find such a local gem. My partner has also been back on several occasions to enjoy Tea Experience, as well as attending your elegant candlelight evening teas and dinner parties. What a wonderful idea! She always boasts to family and friends about your wonderful business. 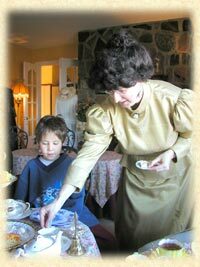 I also know that she has booked a baby shower in June for a good friend and is looking forward to bringing more guests to experience the wonder of the Victorian era, which, you have presented in such fine detail. Thank you again for making my Mother’s birthday so special! We look forward to visiting Tea Grannys and Friends again soon! Simply delightful. Best Wishes in an exciting business of warmth, joy, and tea-time. Much thanks. Service fit for a Queen, like myself! Totally Awesome. I thoroughly enjoyed it! Far beyond all I could imagine! Very interesting, you have to experience it! A fascinating experience, good food too! Elegance to a "T". Thanks for the morning appointment by special request. You have brought me back in time Thank you! Michael P. & Natasha P.
Maria B. & Joe B. What a great setting & wonderful food, tea etc. Thank you so much. We had a wonderful afternoon. The tea, the food, just delicious!